The plan the gets the most elementary stuff spectacularly wrong - and on a site that needs to be far more urban in its basic design. This morning, I posted an article about King Street West in Dundas that included a critique of the Shoppers Drug Mart at King and Albert. 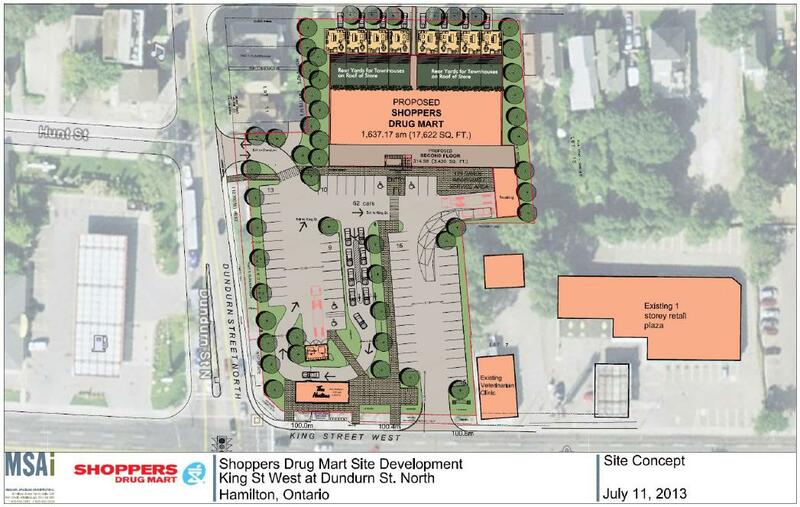 By coincidence, another Shoppers Drug Mart plan is on the agenda at this Tuesday's planning committee meeting (item 6.9). The proposed development does not represent an example of transit-oriented development that supports public transit and pedestrianism. Shoppers applied under the old Official Plan for a permit to develop a standalone store set behind off-street parking on King, with a Tim Hortons (and drive-thru) pushed to the front for greater visibility and a multi-unit building behind it fronting onto Head Street. The full property encompasses 620, 622 and 624 King Street West, 22 and 24 Dundurn Street North, and 41, 45, 47, 49, 55 and 59 Head Street. You can read a summary of the story to date, but the short version is that the proposal has bounced back and forth between the City and the Ontario Municipal Board (OMB) since 2012, including an OMB appeal in September 2013 after the City failed to respond to the proposal within 120 days (oops). There are a few things to like in the plan, including the addition of new, slightly higher density residential units fronting Head Street, but the design also gets the most elementary stuff spectacularly wrong - and on a site that needs to be far more urban in its basic design. The pharmacy and restaurant should be built to the sidewalk on King Street to faciliate walking and transit access, and they should be in a multi-storey mixed-use building that incorporates other uses, e.g. residential, on the upper levels. Instead, they are set all the way at the back of the block behind a deep off-street parking lot. The only building fronting Dundurn is a standalone Tim Hortons, which includes a drive-thru loop behind the building with a double-double double order lane accessible to cars heading west on King or north/south on Dundurn. Not only is this a waste of important King Street frontage, but the drive-thru is a terrible fit for an already-busy intersection that should be an urban centre. Remember that this corner is a key node in the City's east-west transit-oriented development plan. When the B-Line Light Rail Transit (LRT) line goes ahead, this is going be an important transit hub. City planners did some excellent planning exercises with a local residents in 2011 in which they envisioned how the LRT stop could transform the precinct with new signature mixed-use buildings and gateway features. I realize the city has a collective amnesia about the years of broad community engagement and detailed design and planning work that has gone into the LRT plan, but all that planning supports the City's own Official Plan, as well as the Province's Places to Grow framework - and those plans are still in effect. If Councillors in the Planning Committee and at full Council ignore the staff recommendation and approve this plan, this key intersection will be stuck with a crappy, low-density (no density at the front of the block!) suburban development for decades. We have an exciting opportunity to start designing and building for the city we want and need. Council need to reject the current Shoppers plan, fight it out at the OMB - there is good reason to believe the OMB will side with the City due to our planning framework - and demand excellence rather than meekly accepting whatever we get. Update: this article originally stated that the planning meeting was on Friday. It's actually on Tuesday. RTH regrets the error. You can jump to the changed paragraph. Wait -- so that's an MSA design? Michael Spaziani Architects Inc, based in Mississauga. Whew! Knew it didn't compute. It looks like the parking lot will hold roughly 3x more cars than it currently does, yet I've never seen the existing lot full. Is all this wasted space really necessary? As a resident who already walks to this location and fears walking through today's parking lot, there's no way I will even try to navigate that space if this is what we get! I've never seen more than 3 cars in there at a time. This is a horrid design. It would have been horrid in 1960, let alone today. It's a very bad parking lot there for walking through. There is a lot of pent-up anger coming from people who have been going through the Tim Hortons drive-through; it's often difficult to get them to stop or look for pedestrians trying to get to those businesses. Also, people pull in and out off the urban expressway there at elevated speeds, particularly people pulling in. no no. King St barely moves now remember? Didn't you get the memo from certain councillors that traffic on King is like LA because of the bus lane? Not a freeway at all. We promise. Vote for us. Every parking lot is a bad parking lot for walking through. Whoa, is this downtown Hamilton or Upper Sherman and Stonechurch? Who the heck thought this would be a good design? And can we trust Council to say NO to this crap? Bad design is bad design. This would be bad on Upper Sherman or Stonechurch. We should demand good design across the city. The entire problem is that TDL Group (Tim's Donuts LTD) is running this show. The entire design is to accommodate the Tim's drive through. The Tim Bit representatives at the first public meeting made it very clear they don't give a hoot. They have bypassed the entire process by taking it straight to the OMB. Council, neighbours, citizens are being bypassed. It is unfortunate that a SDM, ostensibly a health organization, is participating in such anti-community and anti-health choices. Bingo. Exactly what is driving this design ... the whole thing is hamstrung by the need to accommodate the needs/demands of Tims. By itself the SDM could be built with at grade with a minimal setback from King and Dundurn, parking below it, and additional development above and behind it (this could be done in phases if the developer feels there isn't the market for it now). The current proposal is just awful and would be hard to retrofit/intensify later without total redevelopment of parcel (that could be decades from now). I was at that first meeting and the Horton's reps were brutal. Sat in the front laughing to each other as elderly ladies shared stories of trying to walk to and from Shoppers and almost being killed weekly. It got heated eventually of course as some gents couldn't take their arrogance and dismissive attitudes of neighbours. Nobody is telling them they can't have a Hortons. In fact, it was suggested they have a bigger Hortons with seating and a patio. They just want the drive-thru and don't care about the rest of the plan. The city is wise to fight this. Once those residential lots are shrunk with a massive 2 storey box store right behind the new condos, there's no going back. If this site is developed properly with way less parking and a street oriented, mixed-use building with Shoppers and Hortons at ground level, there would be space for more condos on Head and longer, proper backyards for the ground level, or perhaps even granny flats behind the street condos. Shoppers and Starbucks opened a rather urban, street facing building on Main St across from Mac recently so we know it's possible to do. Unfortunately Hortons has no business model beyond drive-thrus. absolutely. A massive suburban parking lot and box store crammed all the way back to Head St is horrid planning in any neighbourhood. Why not just get rid of the Tim Hortons altogether? There's another one in the gas station on the same intersection, AND another one in the Fortinos strip mall (both of which have drive-thru's). Why the hell do we need 3 Tim Hortons stores on the same intersection? There is also an aggressive drive through location 1 block west near New St. on Main St, which is functionally part of this same highway oriented intersection in question. So I agree, why do we need 4 Tim Horton's stores on the same intersection? Um, neither of those have drive-throughs. Are you even familiar with the area? One could argue that Tim Hortons' interest in so many stores there is itself an indicator of how dysfunctional that area is as a destination rather than an over-engineered pass-through for fast automobile traffic. I know people have to get on and off the highway, but the sheer deformation of the urban fabric on King, Dundurn and Main is a grave disservice to local residents and a squandered opportunity for a high quality urban environment. I heard somewhere that the Tim's lease for the site includes clauses that guarantee visibility from King as well as a drive thru. While it would be great to see that site improved and made more urban, its my sense that the reality is that the city will have to keep denying their proposals until the lease expires, the owners decide to go elsewhere, or the economic environment changes. While we're geeking out on Planning applications, everyone should check out Item 6.8. Yikes. Three towers on a sliver of land basically on the escarpment. And this one is being recommended to be approved. Wow. I'm actually quite a fan of that small development on Charlton Ave. A great use of old brownfield land, adding nice living spaces with direct access to the rail trail. Not sure I've ever heard the word 'tower' associated with 6 stories. lol Atlanta is currently seeing much development like this along their Beltline...a fantastic active transportation corridor linking different areas of the city. I would love to see us do the same. We are great at talking the talk on active transpo options, but never actually following through. We are also very good at recreation bike/walking trails, but horrible at building them into everyday life and commuting. 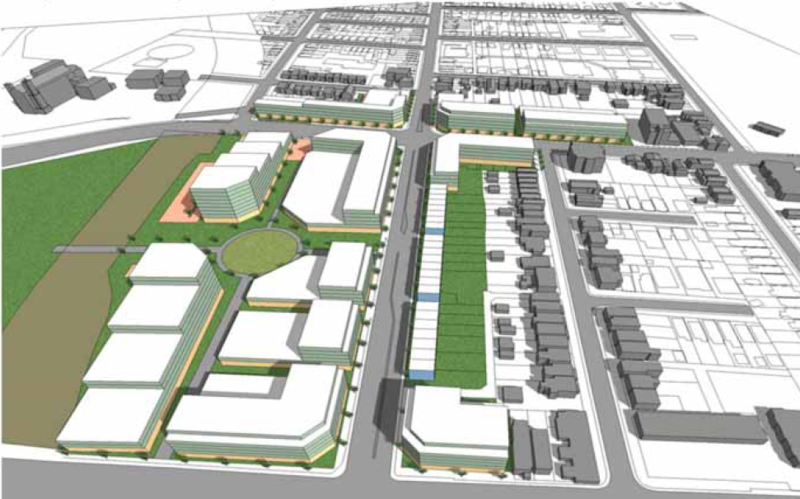 This project will allow residents to ditch the car and do plenty of biking and walking. And hopefully adding more needed residents will allow the discussed cafe plans by Harry Stinson to move forward someday. Mid-neighoburhood gathering spots and coffee shops are a great sign that the population is active and can support it. I like what I'm seeing in that area with the recently approved condos on Charlton a bit further west, the Lifesaver condo proposal, Stinson lofts, this new project and a soon to be announced apartment building next to the Claremont Access on Charlton at the Corktown Park entry to the rail trail. Maybe Hamilton is finally going to start to add good density in neighbourhoods and corridors that encourage modes of travel other than the car. Three six storey towers and an underground parking garage on 72' of land on the edge of the escarpment is insane. It will spoil the view for Stinson School condos and shade most of Alason street. Residents were mostly ok with original 3 storey/above ground parking, but things have gotten greedy, ugly and cheap. In my opinion, there are way better sites for intensification that will have more effect on a local economy (ie, 10 block radius). To the south is a mountain access. To the West is a mountain access. To the east a 90 degree bend in the road is combined with a recreational trail where someone was killed in the past year or two. Cars are accelerating for the access and its not a particularly pedestrian friendly strip. While it is on the rail trail, its not an urban site. No doubt the current use is not highest and best, but I don't see it working as you describe. I'm not a naturalist that thinks we need to see everything left as trees. Nor am I anti development. Nor am I a status quo. I simply don't see people walking from their apartment or condo, to Wentworth, down to Main to the No Frills for groceries. An the flyovers/underpasses to the West aren't that great to walk around either. Mapping the location on gmaps shows that No Frills is only 10 minutes away, but I think crossing the tracks will be a barrier. Hey, maybe I'm wrong. Time will tell. I also do not understand the opposition to that development. I'm seeing signs on yards and I don't know what the issue is. Is it about the escarpment view? It's currently a defunct hall with a surface parking lot. Are the opponents ok with the current use? I truly believe that we are seeing these small but vocal backlashes against every single development for a few reasons, all stemming from one main reason: 40 years with no urban development. Height is a complete non-issue at 6 floors. But for the rest of the projects that get criticized for their height and what it will do to property values, one only needs to look at Ottawa, TO, Vancouver and any other successful urban city to see if igher densities increase or decrease values. It should be noted that Hamiltons lower city saw its property values steadily drop compared to the rest of the city as the population shrank through the 70s-90s. If the view of a condo in a neighbourhood equals a drop in value and quality of life, please explain Vancouver. More people=more eyes on the street=more local commerce=more folks walking and spending money locally=more investment=safer streets=higher property values and quality of neighbourhood life. One of my regrets from my days on City Council was supporting a drive through. Hamilton should ban all future drive throughs, They are unsafe, add to air pollution, and contribute to the rise in obesity. King and Dundurn: if you want my opinion then there are too many cars. People meaning drivers are impatient and at times hostile. I do not like their new plan, it would be worse then it is now. Maybe people who do not use cars should be the priority, those of us who walk, bike, use public transit. I participated in the half-day Charette the City organized to imagine good denser urban design at King/Dundurn back in June 2011 (i.e. I took a vacation day to donate my time to the city). The City's urban design staff were very skilled and knowledgeable in guiding us through the process of imagining a much denser urban design that would fit well into the existing neighbourhood and take advantage of its location at a major transportation hub (freeways, GO, LRT). They kept emphasizing that surface parking should be minimized (and never front the street) and that continuous mid-rise buildings actually achieve higher density than 30 storey towers (due to the need for space around the towers and space taken for elevators and other services). Instead of something that at least respects these principles, just three years later we are presented with a plan that goes against every one of them! If the City and developers can get this simple development so wrong, how can residents trust them with bigger projects? It is at least gratifying that staff are recommending against approval. In the downtown core, instead of a continuous street wall of mid-rise and some high-rise buildings, we may be in danger of getting more 30 storey Landmark places, while keeping whole blocks of surface parking. This is obviously not good densification, and it was not what the planners were recommending. Interestingly, some studies show that beyond 7 storeys residents tend to get disconnected from the street: they avoid going outside unless they have to because it feels like a big deal just to get out out of the building. And remember that Paris is almost entirely 7 storeys and manages a very high urban density. At the very least, the residents of Christchurch will be able to say they will live in the sort of city they want (rather than what the developers feel like building on any particular lot)!